Share this product and receive a $3.68 sharing discount. Thomas Kempis was a fifteenth century monk and essayist, most well known as the author of Imitation of Christ, a book of devotion, and after the Scriptures, themselves, one of the most widely read Christian texts. This quotation which in its entirety reads: First keep the peace within yourself, then you can also bring peace to others, exemplifies his search for an understanding of spiritual truth which each person must discover for themselves. 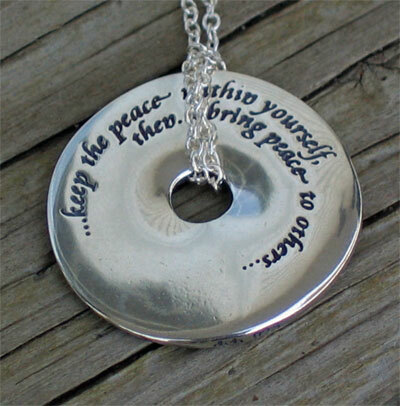 The abridged quotation has been elegantly engraved upon a pendant of seemingly contemporary form. In fact, the softly organic and irregular pieced shape has been adapted from the ancient Chinese pi disc, a symbol of nobility and eternity. 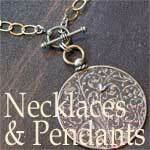 Made in the USA .925 Sterling Silver pendant 1" by 1" wide. Hanging on a 18" sterling silver chain.